Saturday January 9th 1875 The coldest day of the season the thermometer stood 20 degrees below zero. We were till nearly noon getting thawed out and the work done. I worked in the afternoon on my little black sacque I am trimming it with jet beads. The boys hauled corn. Uncle went downtown in the afternoon, he brought me a letter from Charlie. Ira went down in the evening . Owen spent the evening here. After Ira came home we had a splendid game of whist. How I did enjoy it. And then I went and I had such a good visit talking over old times. We all invited him to stay all night. But he would go home. 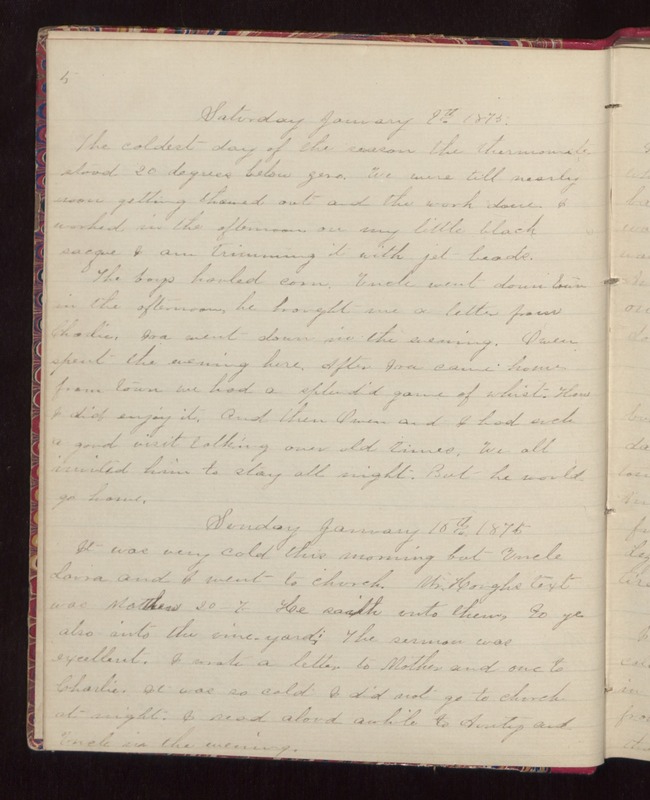 Sunday January 10th 1875 It was very cold this morning but Uncle Laura and I went to church. Mr Houghs text was Matthew 20-7- He saith unto them, Go ye also into the vineyard. The sermon was excellent. I wrote a letter to Mother and one to Charlie. It was so cold I did not go to church at night. I read to Aunty and Uncle in the evening.